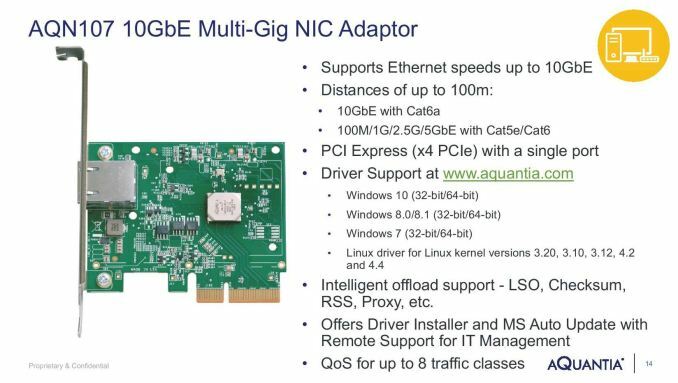 Late last year, Aquantia launched their range of multi-gigabit Ethernet controllers. These were controllers that could enable 1G, 2.5G and 5G connections over standard RJ45 connectors and Cat5e cabling. At the time, the two launched controllers were offered to OEMs to add into their custom motherboard builds, such as enterprise focused machines with a 5G office network in place. 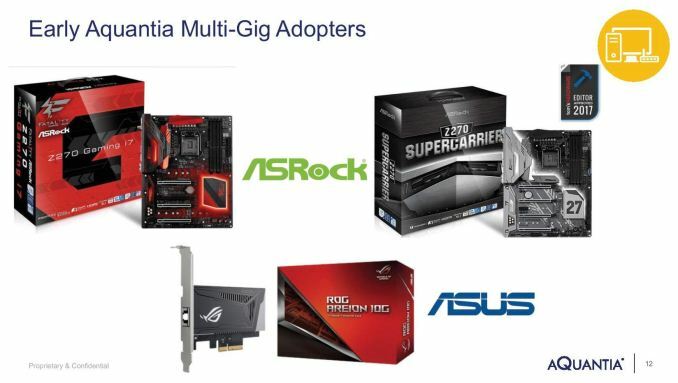 We have also seen motherboard manufacturers pick up the mantle, with consumer motherboards such as the ASRock Z270 SuperCarrier and the ASRock X370 Gaming, using the 5G Aquantia AQtion AQC108 chip. 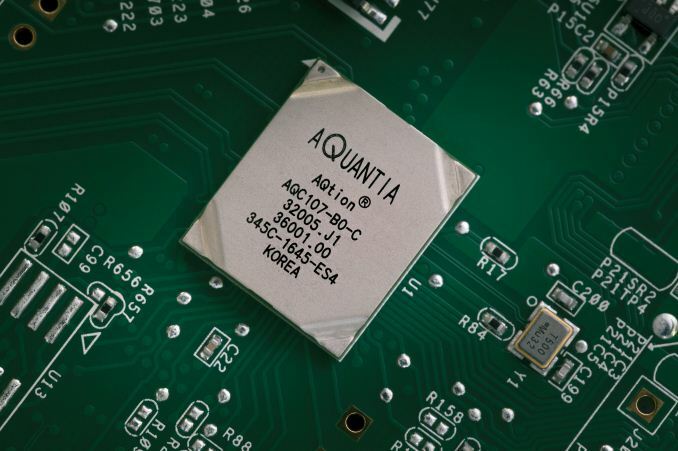 Today's announcement cements Aquantia's lead in the multi-gigabit Ethernet space, despite already having an apparent 2 year lead over other rivals in this space (it helps that Aquantia helped define a major part of the 2.5G/5G specifications in the NBASE-T Alliance). 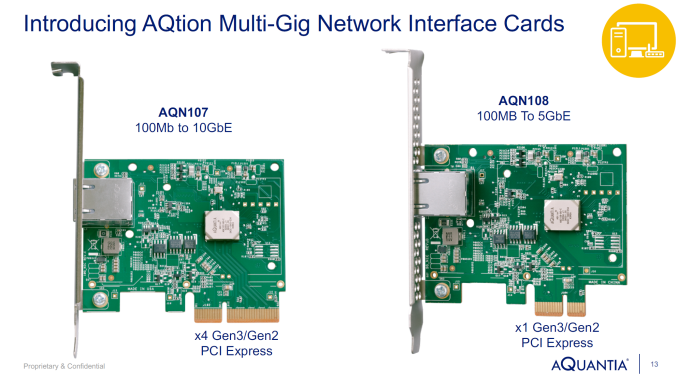 Aquantia is launching two PCIe-based single-port network cards using their AQC108 and AQC107 controllers. Both of these cards equip a system with a single port, with the AQC108 based card supporting BASE-T standards from 100M to 1G, 2.5G and 5G and uses a PCIe 3.0 x1 interface. 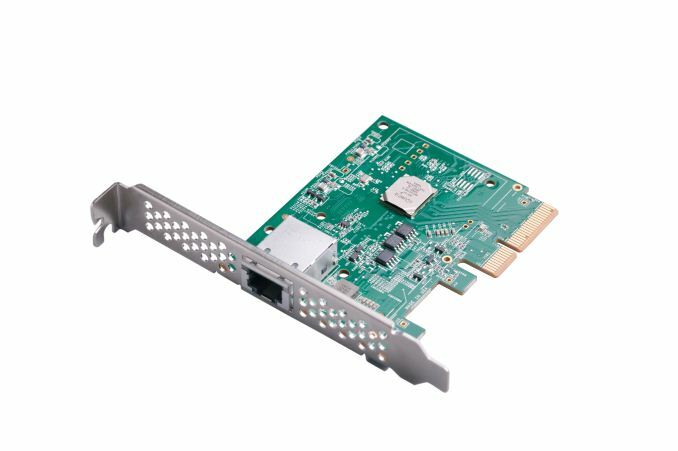 The beefier AQC107 based card supports the same standards as well as 10G, and uses a PCIe 3.0 x4 interface (both cards will work down to PCIe 2.0 x1, with reduced data rates). Drivers for both cards will be available for the Windows 7/8/8.1/10 (also as part of the Windows Update solution) as well as varieties of Linux (3.10, 3.12, 3.2, 4.2 and 4.4). The idea behind these cards is the same as other network cards - to be able to offer functionality without having to embed the controller on the motherboard or into a prebuilt/legacy system. In the consumer world, we have plenty of offerings of Intel and Realtek based gigabit Ethernet cards (even Killer NICs back in the day), and Intel commands the 10GBASE-T cards with its X540 and X550 series. Aquantia is hoping to shake up this market, particularly for businesses and end users willing to invest in 2.5G/5G infrastructure. One of the big questions surrounding the transition to 2.5G/5G for home and SMB is infrastructure - making sure the network backbone, switches and access points are all capable. The major enterprise network players are already deploying multi-gigabit Ethernet networks to their customers, however it will be a bit longer before commercially available switches for consumers are available. 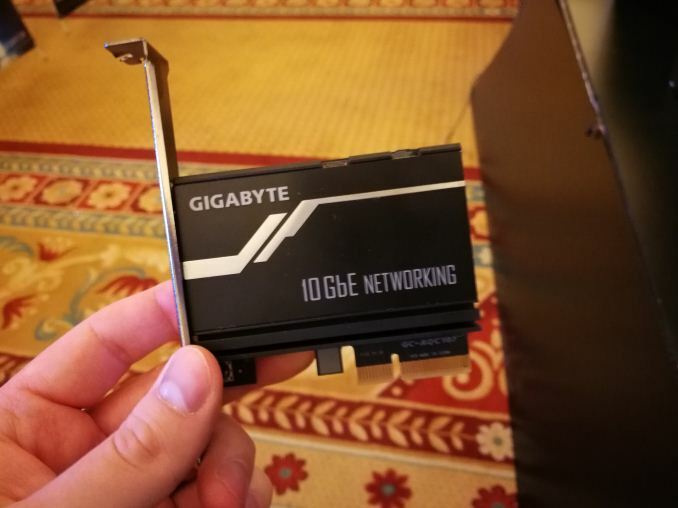 One of the major drawbacks investing in 10GBASE-T in the home right now, aside from the $100-200 per port PCIe cards, is the cost of the switches. This is something Aquantia isn't doing directly, but we have been told that they are working with partners (the typical enterprise players at least) to solve. The depth of those solutions remain to be seen (we've been told similar by 10G switch vendors who had a different interpretation of 'mass market'), but ultimately for this technology to become ubiquitous, we need to see cheaper switches ($25/port), followed by cheap implementations, as we have seen in the last 15-20 years with gigabit Ethernet. Final pricing is set at $99 and $127, with the 5G card being cheaper over the 10G card. Aquantia stated in the briefing that they are planning to sell the cards direct to consumers, or OEMs can brand the cards in their own style (eg imagine gaming based cards, as we've seen from Gigabyte already, or ASUS and their recently announced ROG Areion 10G card using the AQC107 chip) for their customers. It would be interesting to see if a manufacturer will offer a multi-port card by placing 2-4 chips on the same PCB, even if it requires a basic PLX switch. Four 1G/2.5G/5G/10G ports for $549, anyone? Review samples are currently being circulated, and I'm discussing with Ganesh the best way to test them, especially as we don't have any 5G switch equipment. We're also looking at angles to test these ports as they appear on motherboards too. Aquantia expects the cards to be on shelves shortly, with branded cards to follow.